07.28.05 SFJFF: So, how did it go? Well, it was great. All worries dropped the minute the party started. Although I do worry like a grandmother with an ulcer before a big event, I have the uncanny ability to stop worrying the minute the action gets going. Phew. Our pre-party at the Lucky 13 Bar was fun. The bar has a rocknroll vibe and a good jukebox so that helped set the tone. This crazy old hippie-punk-activist guy called "Diamond Dave" showed up--a true Bay Area character--and he told me that the bar in its former life used to host some of the area's wildest punk shows, so I guess we were paying a homage of sorts. Our drink sponsor was He'Brew (The Chosen Beer) so that in and of itself was pretty funny. I didn't have time to drink because I was too busy being a hostess and greeting all of the AMAZING peeps that came out. We definitely had a good Jew/Punk/Jewish-Punk mix going on. There were some friends there that I hadn't seen in a couple years (Jo!) and some that I hadn't seen in about TEN years (Tal!!!) so that was a treat. We headed over to the theatre a bit earlier than the rest of the party to set up and then, BAM! Movie time! 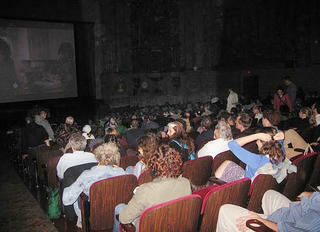 There it was--Jericho's Echo on the huge, luminous Castro Theatre screen in front of a 400-or-so person audience. Wow. I wish I could say that NONE of my fears were confirmed, but unfortunately my concerns about the lateness of the hour were pretty spot-on. Not only was the film programmed at 10:30 PM on a Wednesday night, but they played a 20 minute short beforehand so Jericho's Echo didn't even start until 11! That meant that people did have to get up and leave to catch public transportation before my film was over. That was definitely a bummer, as was the notion that had the film played a couple hours earlier, there probably would have been a much bigger crowd. That being said, it really was awesome to screen there and the people who did come were very enthusiastic. Nancy Fishman, the programming director for the festival, introduced my film and called me a "filmmaker to watch." Oooooh, I like the sound of that! I got some questions during the Q & A (my favorite part!) that I hadn't been asked before, so that always makes it more interesting. Someone talked about the association between punk rock and certain drugs, like heroin in NY, and if there was a particularly Middle Eastern drug associated with Israeli punk. I was glad about that one because it gave me one more chance to bust stereotypes. I could honestly answer that aside from the massive amounts of beer and vodka consumption I witnessed during my shoots, I never saw one illegal drug being used the entire time I was in Israel. All in all, the best part about the screening was feeling so supported by my community, like I really have a place here. There were so many excellent people in attendance from all over the Bay Area and from all different parts of my life...my favorite waitress Mary, Steve from the Landmark Theatres, my college pal Ryan, my high school pal Hannah's parents, my in-laws, Floyd from Fat Wreck Chords, Jericho's Echo's editor Joseph and motion graphics designer Phil, some of the middle-school teachers to whom I have given media workshops, Rachel and Carlton from the Mission Minyan, lots of friends...the list goes on. It's pretty amazing to think I have only been here 5 years and I have somehow touched so many lives. To me, the term INDEPENDENT FILMMAKER isn't really accurate, because really we are dependent on that kind of support from our communities at large. Thanks, San Francisco, from the bottom of my heart. It's about 5:33 AM on the morning of my big Castro screening. Did I say big? I mean BIG. At least that is how I am feeling right now. By all rights, I should be sleeping. The screening doesn't even start til 10:30 PM and there's a short playing beforehand. That means that I have to be bright-eyed and bushy-tailed for a Q & A about 19 hours from now. But what am I doing? I'm sitting at my computer with heartburn writing to you folks and worrying about everything that could possibly go wrong tonight. I wonder if because it's a Jewish film festival there is an extra amount of neuroses in the air?! Since I'm hoping this blog will be a resource for other filmmakers who are doing the festival circuit (and to make myself feel better), I'm going to let you in on some of the things that I am concerned about at this bleary-eyed moment so that you know you are not alone if you ever feel this way before a BIG screening. First of all, let me share some advice: don't go out and eat a bunch of junkfood before bed on the night before your screening. I know, should be a no-brainer. But you see, my in-laws are in town alll the way from Florida for this event. (I know--that's love!) and my brother-in-law and his gal came up from LA to meet us all last night (More love!). They didn't get in 'til late and Seth and I joined everybody for a late-nite "snack". Of course, all we could find by the time we settled down to eat was a greasy spoon in the backwaters of Milbrae and, well, let's just say that I'm sure my menu choices contributed to my current discomfort. Movie side-note: This was after, by the way, I got to see 4 films by directors who are all here at the festival and who I have had the pleasure of meeting. One of them was the lovely film Poumy. If you are a faithful reader of this blog (That's you, Mom and Dad), you may remember that I stayed next door to Marian, the producer of Poumy, at the Toronto Jewish Film Fest. Well, the director of said film is Sam Ball, whose work I have long admired. We finally met during this fest when we were guests together on the whacky cable access "Movie Close-Up" show and I must say he is an absolute gem. I hope we get to see more of each other. The other films were The Nuclear Physicist Gives His Son a Haircut, a sweetly self-reflective animation by the sweet New Yorker Hanan Harchol, Professional Revolutionary: The Life of Saul Wellman by Judy Montell and Commune by Jonathan Berman. 5. Expectations are so high because of all the amazing press we've been getting that people leave saying what I usually say after a movie...something to the effect of "I don't see what all the hoopla was about!" 4. People get up and leave before the movie is over because it is programmed SO LATE that if the opening ceremonies go long, folks will miss the last public transportation if they don't split early. 3. I thought that the Castro had 800 seats. I just found out it has 1400. WHAT?! I was worried about filling 800!! 2. I pass out on stage because I'm up at 5-freakin-thirty AM or I trip on the stairs on the way up to the stage for the introduction or I just get under the bright lights and look like a heroin junkie from lack of sleep. 1. The scariest thing--the Beta-SP dub made for this festival has never been tested all the way through. What if all other fears are allayed and the theatre is full and IT DOESN'T WORK?? AHHHHHHHHHHHHHHHHHH!!! OK, I feel better now. Do you? "I believe it is the role of the Jews to be on the side of the oppressed." I have found the festival programming this year to be extremely thoughtful and thought-provoking, particularly on the topic of Jewish morality. ...This past January marked the 60th anniversary of the Death March from Auschwitz: as the Russians advanced on the German lines, the 60,000 remaining prisoners at Auschwitz were forced to walk 40 miles in the bitter Polish winter under the most brutal circumstances to an evacuation station, where they would be transported to German camps away from the front. Some 20,000 are thought to have perished along this path. On the anniversary in 2005, van Loon, with a camera mounted to his body, walked this same route. I'm getting to that point of almost euphoric anticipation that happens before a big screening. (This precedes the all night tossing and turning, worrying about everything that could go wrong). The excited feeling comes from the opening events that have taken place over the past couple of days. They're getting me all ramped up for the adventures to come. The big opening event at any festival is, of course, opening night. The Castro Theatre was decked out in its finest, for the always overcrowded but high-spirited pre-party up in the theatre's mezzanine. Maybe it's just because it's the Jewish film festival, but this party always has the feeling of a Bar-Mitzvah to me....what with all the kisses, finger foods, and older women putting mini-brownies from the dessert tray into their purses "for later." Of course, I am right in there among the masses, fighting for bits of delicious foodstuffs--the carmelized brie was the winner for me this year. The opening night film was "Go For Zucker! ", a German-Jewish comedy by the adorable German director Dani Levy. I enjoyed the film--it was refreshing to see a comedy for once, when my typical fare consists of uber-serious documentaries or big-budget sci-fi special effects blowouts. I won't spend too much time on a synopsis, but basically it is about two German brothers who haven't spoken for 40 years. When their mother dies, her stiupulation for them to get her inheritance is that they must sit shiva together for 7 days and make up. Pretty basic stuff, except that one brother is a gambling, but somehow loveable, hedonist, and the other is an Orthodox Jew. The most interesting part was hearing Dani Levy speak after the film. First of all, he was just fun to watch--he seemed to have the goofy neurosis of Woody Allen mixed with the energy and abandon of Roberto Benini. He said that he was shocked how well it had done in Germany (It won all sorts of German film awards, including Best Director). He said that Germans were starving for portraits of modern Jews, unassociated with the Shoah. I was surprised to hear that it is likely that residents in much of rural Germany don't even KNOW any Jewish people. I guess this shouldn't surprise me, but I just hadn't thought about it. I suppose in much of the rural U.S. the same could be true, but for very different reasons. At any rate, Dani talked about how the urban German comic sensibility was shaped by Jews in the entertainment business in the early 20's, much like in New York City. He theorized that that is one of the reasons why so many German gentiles can relate to his movie. I have really mixed feelings about the phenomenon--it's kind of uplifting and yet so fucked up at the same time. The most EXCITING part was feeling the opening night energy in the Castro and realizing that, indeed, my dream of screening in the amazing place will be realized next week! The following night (last night), I was lucky enough to attend the Filmmakers' Shabbat Dinner. It further excited me about the rest of the festival ahead because of the genuinely warm feelings all over the place. It was held at the gorgeous studios for PhiloTV, a post-production firm, but they managed to make it feel homey by having everyone in the entire joint introduce themselves and give their affiliations to the festival. More than one person called the festival their "favorite Jewish holiday". One woman, a festival board member, said that her father passed away one week ago and she was attending the festival as her memorial to him. Wow. There were a LOT of people in the room who had been involved with the festival for all--or at least most--of its 25 years. I felt really proud to chant the Shabbat blessings over the bread and wine with such an incredible crowd of filmmakers, former blacklistees, festival board/staff, and just plain film lovers. 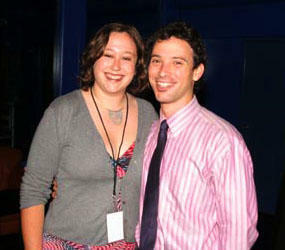 07.20.05: SF Jewish FIlm Fest is Here! I was at the San Francisco Jewish Film Festival about five years ago, shortly after having moved to the Bay Area from Boston. I saw so many diverse films there and witnessed so many enthusiastic filmmakers gliding gracefully up to the stage following their screenings, that I became inspired. 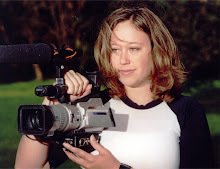 After all, I had a professional background in education, technology and graphic design, so documentary filmmaking seemed like a natural leap. And the prospect of having my very own post-film Q & A session was icing on the cake. Some filmmakers shy away from this opportunity, but not me. I was ready to answer questions before I had ever even come up with an idea for a film! “What chutzpah this girl has!”, Ms. Plotkin must have thought. And she would have been right—I still had yet to take a film class, let alone write a proposal or begin production on a piece. But she smiled politely and wished me luck. I have worked at, volunteered, and attended hundreds of film festivals since then and this year, my dream has finally come true. My first feature-length documentary will be screening at the San Francisco Jewish Film Festival this summer. Last night, I attended the festival's 25th Anniversary Gala, to get the party started right! (The festival's offical opening night is tomorrow). I even managed to drag my man along (Looking quite dapper I might add), and was so glad he came. The wonderful folks at the festival have seen me hanging around the office quite a bit lately, so it was nice for them to get a little more context of my life. I have worked and volunteered at so many festivlas in this town. I can't tell you how fun it is to be on the other side...to be one of the guests that those overworked and underpaid festival workers are working so hard to please! The best part about it is that I've SO been there, so hopefully I know how to throw much love back at them. I know you can sometimes feel underappreciated as a festival employee. My buddy and local indie film luminary Molli Amara Simon is working for the fest this year, along with some other sweet and kind folks who I am looking forward to spending more time with as the festival progresses...like Dafna, Ian, Betsy, Leo, and Chris from Larsen Associates. Speaking of Larsen Associates (the publicisit for the fest), today is my day to be a big fish in a small pond...glub, glub. Yes, today is the day that Liz Nord takes over the Bay Area media on three fronts and the Jewish Media Conspiracy is once again proven to be true. Ha ha. But seriously, today the SF Bay Guardian weekly newspaper comes out with a feature on yours truly. This afternoon, I will be interviewed on KALW by Sandip Roy (yayyyy! I LOVE public radio!!! ), and this evening I will appear on Movie Talk TV Program. Bam! Bam! Bam! And what am I doing? Sitting on my couch, writing to y'all. Now, don't you feel special?